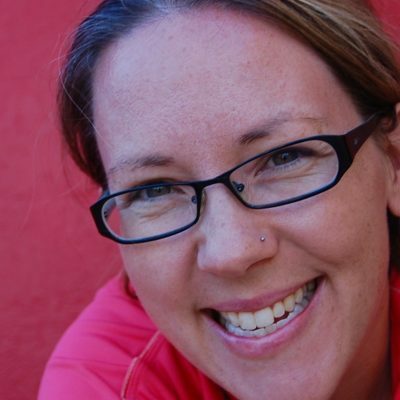 Lisa Lopez Smith, a Canadian citizen living in Mexico, spent seven days walking a 75-mile route through the Sonoran desert from Sásabe, Mexico, to Tucson, Arizona. She shares her experience of trekking in blistering 40-degree heat and sleeping beneath the stars. He returned my stamped passport with a frown. It was my first visit to Trump’s America, and it seemed significant that a peaceful walk in memory of those who have died crossing the southern border through Arizona’s desert could be so easily misconstrued as having violent intent. 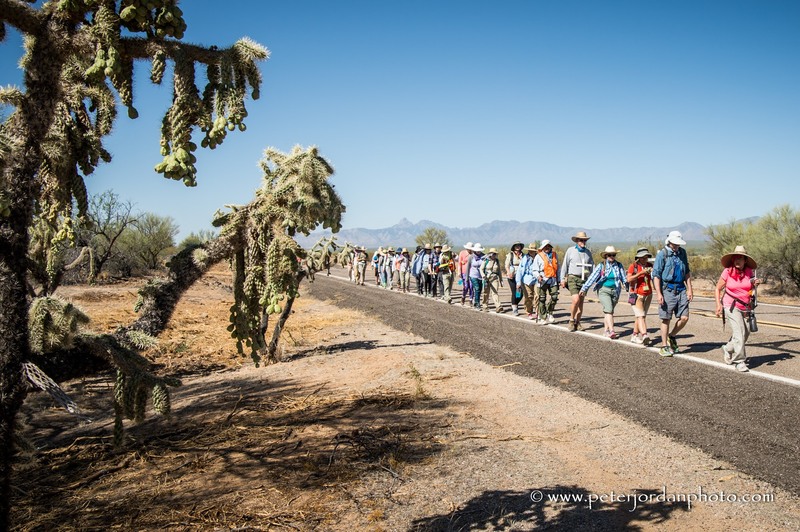 The Migrant Trail a seven-day, 75-mile journey through the Sonoran desert from Sásabe, Mexico, to Tucson, Arizona, is in its fourteenth year. 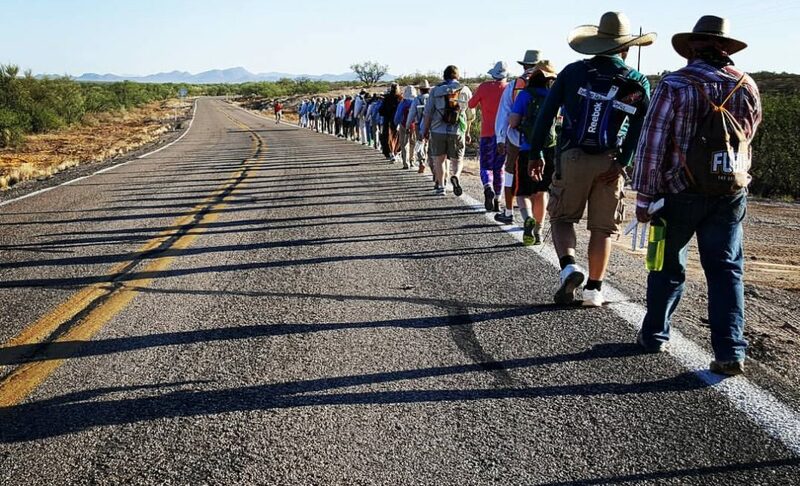 Founders have promised to walk until deaths on the border stop, but until US policies refocus on the reasons people are willing to risk the perilous crossing, and decrease the militarisation of the border, it seems likely that this annual walk will continue. We drove to Sásabe, a small village practically glued to the border. After a meal and short blessing at the Sásabe church, we carried three symbolic coffins to the wall: a man’s, a woman’s and a small child’s. In the first half of 2017 there had already been 115 known deaths along the border. That morning we heard news of a woman who entered the desert with her three-year-old child that same week. They haven’t been heard from since. The ugly, rusty wall dividing one side of the hill from the other stands only in areas where the border is easy to cross, essentially making a funnel for migrants into the most dangerous parts of the desert. At the wall, we held a ceremony, infused with native and Catholic traditions, Spanish and English, and indigenous songs. We crossed into the States without issue, locking up our passports in a small box as a symbolic gesture of walking, not as a citizen of a particular country, but as humans in the desert, with no country but the environment where we were walking. Some took a small white cross bearing the name of a person who had died in the desert, carrying this symbol of death and remembrance for the length of the journey. My cross remembered, with permanent marker letters, “Desconocida,” an unknown female, of an unknown age, whose remains were found in 2013. Only one day in the desert sun can render a corpse unrecognisable. The desert sun erases identification as easily as it erases lives. Various non-profit groups on the border do the essential humanitarian work of leaving water bottles stationed throughout the desert. Migrants can’t carry enough water to last the days it will take to cross. On our walk we could easily drink seven litres each day to keep healthy, while a migrant’s water jug would only hold about four. Unfortunately, vigilantes and the Border Patrol often destroy the water bottles and supplies that the humanitarian aid groups leave. No More Deaths, a Tucson organisation, has stated that human remains have been found at water drop sites, where water jugs had been slashed or destroyed. I hadn’t expected the Arizona desert to be so lovely: high mountain ranges framing the plain that was covered in verdant mesquite and cacti, and nights that were so clear with the Milky Way streaking across the sky. Most people slept in tents, but many of us instead just slept on tarps in our sleeping bags under the stars, bundled against the cool night air. With more than 50 walkers in the group, we had multiple support vehicles: a food trailer, a trailer for all the sleeping gear, a truck to regularly refill water bottles along the way, and all the essentials for portable toilet systems. 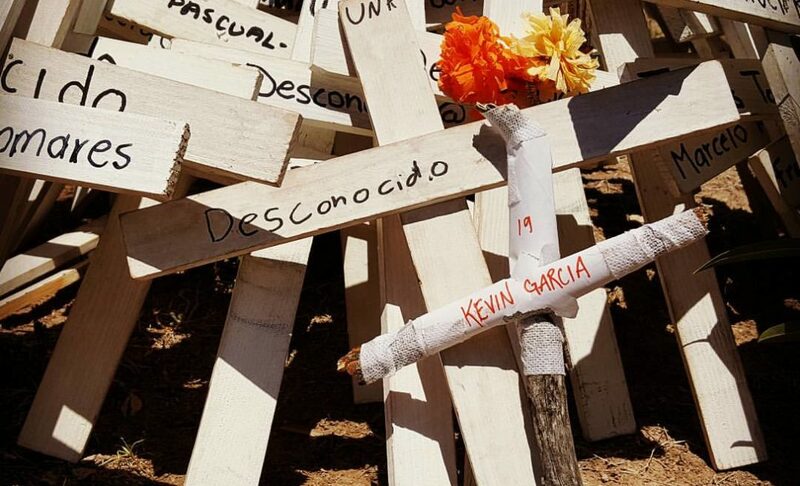 Intermittently we would walk in silence, and once the trucks were in sight, we’d take turns calling out the names of the people on each cross that we carried, and the group would reply, “¡Presente!” a Spanish word to invoke the presence that the dead still have amongst the living. It was always a powerful experience; the endless waterfall of names, and among them, the multitudes of desconocidos and desconocidas—the unknowns—whose identity was lost along with their lives. There are organisations working along the border that use DNA testing as well to help family members to know what happened to their loved ones. A death of one person is never just a death, the impact ripples out across families and friends, but the unknowing of what happened is often worse than receiving confirmation. By the second day, we started spotting remnants of migrants’ passing: empty water bottles and backpacks and clothing. The water bottles, painted black so as to not reflect the sunlight and draw attention to themselves, were often hung on homemade strings. 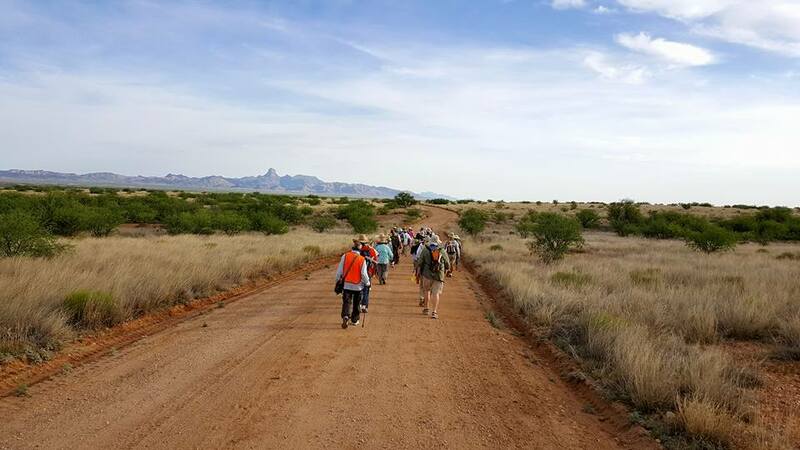 A long-time walker told me that the Border Patrol, when arresting someone, would force them to abandon everything they carried, despite knowing that they were carrying treasures and memories: photos, rosaries, prayer cards, and phone numbers. To further the indignity, on the highway we saw trucks that looked like dog catcher vehicles—cages with only one tiny window at the back. After walking all morning, the afternoons we spent in camp were almost as exhausting. We’d set up canopies and tarps or head to shady spots under the mesquite bush to wait out the penetrating, itchy and dangerous heat of the day, reaching more than 40 degrees in the daytime. An unexpected delight came in the form of the daily water delivery, supplied by Humane Borders who maintain water tanks throughout the desert. After filling our jerry cans for the next day’s walk, they would cheerfully spray down anyone who wanted a fully clothed shower. The water was warmed by the sun, and yet still refreshing after a long walk in the thorny dry sand. Blisters became a problem for me by the third day, and I had to rely on a ride to get me to camp in order to dress them properly. During my training walks, I had learned that a well-managed blister doesn’t hamper walking ability at all; however, out on the trail it was a daily chore to keep my feet in walking condition. Others suffered from heat rash or exhaustion, and those of us who dealt with these relatively minor conditions soon realised that those blisters could have killed us if we were migrants unable to keep up with the group. I thought of my sons, and my husband, and that while I would cross any desert for them, I also wouldn’t survive the desert alone. How many mothers must sit in that heat, just like me, thinking of their family, but discovering that they’ll never see them again? Our longest day was a 16-mile walk, meaning a 3.30am start. We packed up camp by headlamp, and walked into the sunrise. As the sun climbed higher, it lit up the sacred mountain of the Tohono O’odham people, bathing the hawk-like Baboquivari Peak in a golden glow. 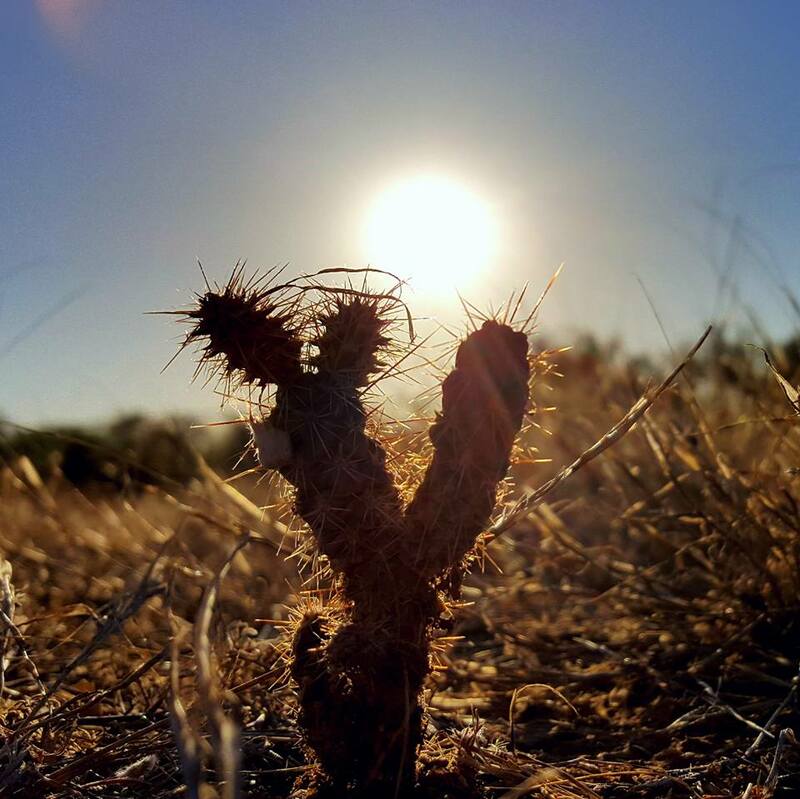 The parallel beauty and cruelty of the desert left me in awe. As we returned to the highway, we approached the border checkpoint along Route 286. The Border Patrol was expecting us, and there were at least 10 agents waiting at the lonely outpost. Approaching, we started the long chant of names of the dead on our crosses. Perhaps it was the wind to our backs carrying our voices but we shouted the names, as loudly as we could. The dead, who had been loved by so many in their lives, were still with us in that moment. The team with our vehicles on the other side of the checkpoint said that they heard us from far off in the distance, long before we reached the military line. We fell silent again at the checkpoint. One-by-one we crossed and the officers asked, “Citizen?” to each person. A Canadian, I firmly replied, “No!” but the officer waved me through, his eyes already on the two walkers behind me, one from Mexico and one from Colombia. They were pulled to the side to answer some questions, while I turned back, gaping, not sure if I should turn myself in for the Border Patrol’s white-washed failure to catch an “alien”. Just beyond the checkpoint, taking a water break while one of our support trucks blasted out tunes by Agustín Lira and Alma, with their songs of migración, we received a phone call from No More Deaths. They had received a distress call from a migrant who remarkably had a cell phone signal, and the aid group requested volunteers from our ranks for their search team. For most of us, that was when reality took hold. Of course it was unlikely that we would have spotted a migrant along our walk; these were people who did not want to be seen. That evening, the search party returned with the news that the missing migrant had been found alive. By then, it felt like we had been walking forever. The days were all melting into sameness: early starts, walking, heat, exhaustion. However, there is some quiet delight in having no responsibilities but to be present, to witness, and to walk. On our last day together as a group we climbed up to a rock ledge above our camp, and held a closing ceremony. We could see the suburbs of Tucson and the expanse of desert, like an ocean horizon spread out before us. Remembering the opening ceremony back in Mexico, we sent out prayers, as we faced the cruel beauty of the Sonoran desert. I returned to my home, Mexico, to my family, to safety and to comfort. For its deadliness, the desert is chilling, and yet, I suspect that Mexico is even more dangerous for those trying to find a better life. The cartels, the inherent dangers of riding atop La Bestia (“The Beast”, the name given to the cargo trains), and being caught by police leave the migrants vulnerable and exploited. The US-sponsored program, Frontera Sur (Southern Border), has given Mexico responsibility to slow the north-bound flood from Central America. Starting in July 2014, Mexican immigration officials, armed with US technology, training, and funding, started cracking down on migrants—more likely, refugees—usually with quick deportation back to the violence and danger of the gangs from which they’re trying to escape. However, with little oversight, the corruption, violence and human rights abuses are rampant. One report shows that 41% of the crimes against migrants were committed by officials. Before I had left home, my boys wanted to know why I was going. It was hard to explain as I wasn’t sure myself exactly why I had felt so strongly the call to walk. Now, I want them to see that those of us who have the privilege of our passports, a skin colour that doesn’t cause questions at border crossings or checkpoints, and the means and ability to go and do things—we have a responsibility to use these tools to resist and to witness and to support change. It is my hope that by the time my boys are old enough to walk the Migrant Trail, there won’t be a need for it. But at this point, with Trump’s new budget including funding to “build the wall”, expand the Border Patrol and increase deportation, an end to the deaths in the desert feels much too far from reach. MORE: “Girls Just Wanna Have Fun-Damental Human Rights” – shot the day after Donald Trump’s inauguration. Images by Peter Jordan and Saulo Padilla. Video by Johanna Huckeba.